Cross linking is mainly processing with the intention to raise popularity in search engine and it denotes the practice of linking between two or more sites i.e., most often, maintained by the same owner or different owners. It will act as progressive or harmful factor of your search engine popularity based on the circumstances and determinations. Cross linking will benefit your search engine popularity, if you are inter-linking several country specific domains of a single company or single owner which serves for a similar purpose. Also it will make the users to find their own country version of the company website. But remember to place the links in a non-spammy way. For example, do not place bulk country specific links in footer which makes the Google bot to think that your site is spammy. Finally confirm that bots can easily crawl your links. If you are inter linking multiple domains that serves for a single purpose and has unique content, cross linking technique will surely lend you a hand. If you are having same content for all your inter-linked sites, try to reduce the similarity for sixty percent when comparing to each other. If Duplicate contents are recognized by Google within cross linked pages this would badly affect your rankings. If you are inter-linking sites using keyword rich anchor texts, it will be more engaging to the search engine bots. It is the best cross linking strategy that helps your SEO marketing in a tremendous way. It will be helpful only if you make it right - making so many anchor texts in a single page will harm your page quality, so be thoughtful. Link Ring - Multiple sites linked to each other in a ring form, with no other sites connected into the ring they construct. 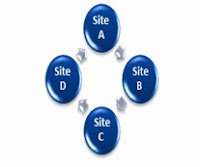 Link rings are one of the SEO practices followed widely in past days. However as a result of recent updates, now search engine bot will surely penalize your site if you did link rings. If you see the image A®B®C®D®A, you will clearly recognize the link ring concept. Although it is not a risky ranking factor for cross linked sites with unique content and relevancy, it’s wise to hosting the interlinking domains through different IP addresses and different contact information. The search engines can effortlessly find out when relevant sites cross link to each other from within the same class C IP address. These links are often cleaned out of the ranking algorithms, if spotted. If your website has excessive links of this type, it can even get a penalty to your site. This is the reason why a number of companies provided the service of “SEO Hosting”. These companies will sell you hosting on entirely different sets of class C IP addresses. Website owners frequently use this practice to hide their mini site networks, blog farms or cross linking networks. Cross Linking is a convenient SEO strategy to get high search engine rankings, if the sites interlinked are relevant and serves for a same purpose. Search engines give more importance to these links, if they are from relevant sites, with related content – it will benefit all your domains. If they are completely isolated in concept - interconnected blindly with the only intention of rankings and not users – then your domains will be penalized. Cross Linking is a helpful approach for your SEO rankings but ensure that you do it in a right tactic to increase the benefits. 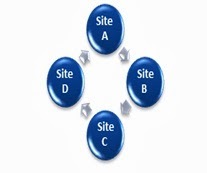 Think of to cross link with related sites that will turn as a better usability and ranking factor. Do not over link so many sites that make it always fine. This information is very nice and is very useful for me and as well as Search Engine Optimization service users. I am Er.Varinder Kumar Owner Techglobusindia IT Services ( SEO Specialist ). we are providing SEO Services. We Are best in SEO. We Have Done 2000+ SEO Projects. We Are Doing SEO With Google New Algorythim. Google Penguin Panda Friendly. In Less Time We Providing Top Ranking On Google, Yahoo, Bing, Msn. Webzin InfoTech provides website designing and developing and maintenance and optimization of both static and dynamic websites having rich contents. I am getting the actual meaning of cross linking in SEO from this blog only.I really grateful to this blog for updating this kind of essential things. Your blog is really useful for many people I think. Because many times I have found the useful information which was really important for me. Reading this your post was good. Thanks for sharing this nice information about cross linking. The information in the blog really helps in SEO work. what a great information. video is also superb!! I want appreciate to you in this post because this includes the great information. Reciprocal link building is now dead idea in Seo. Now this time in world hundreds of companies are doing guest blogging and providing seo services for the purpose to get Do-follow links. I truly believe there are functionality to writing and posting material that only very few have and yes you got it. This is really valuable and I will for sure on the internet my buddies the same. Thanks. I included it to my favorite’s blog site record and will be going over returning soon. Please analyze out my web page as well and let me know what you think. Thanks for your ideas. You can also find the details on Affity Solutions, at the search engine optimization australia. The main object of the Affity Solutions is to provide quality seo services. You are absolutely right. Way to go! What fun…I am really tempted to leave my stressful shuttling-everyday job and just sit at home. I need to earn some money, so I think I might become a freelancer. Talking about freelancing, I came across some amazing e-marketplaces on the web planet - Gicree, Zopgraphics, and so on. Now, I think it is time to make a change. Thank you for making me realize what I have to do. Good job !!! !Your blog is really useful for many people . Because many times I have found the useful information which is really important for me and going to proof very beneficial for everyone.Thanks for this wonderful post. Awesome information. I do believe all the ideas you’ve introduced on your post. Thanks for sharing. All the points are good! I am lucky that I have got your blog right now. Richmind Softlabs Web Design Company India India offer SEO friendly responsive web designing services including website maintenance and seo services in Jaipur. high rankings. seo optimization services experts can help you stand out amongst your competitors and make sure you gain that edge. But, if you hiring social media marketing service Company, just paid that services one time, and we will always in top position without spending much money for extending their services or paid them every times. Thanks for the share.Truly informative and useful information.Great work,keep updating. SEO is a rising field and it is gaining ground which plays a critical role in web commerce. SEO optimized website is fast, easy to use and a webpage with high rankings will also gain more social media exposure. I was looking for cross linking articles and came across to your post, I really like it. Thanks for sharing. Glad to read your article. It is essential to know about cross linking and using anchor text while working on it. Cross linking is very important aspect in SEO. It was well written and nicely preseted. Thanks so much for this post! I'm completely new to SEO and this was really helpful and clear. I am looking for affordable Digital marketing services provider in india. Find best SEO company in Jaipur. Best SEO Services packages across digital world. Its Great honor to see your Video. i Think this is the one of the best videos by matt cutts thank you sir. Thanks for sharing a very interesting article about The Cross Linking Impacts – SEO Verdicts. This is very useful information for online blog review readers. Keep it up such a nice posting like this. In this digital era, every kind of business needs to do the advertisement for the company and its services. The IT Company provide the best IT services for business development. They monitor all the ups and downs of the company in the market and then they manage the things for the business profit. Thanks, admin, to enlighten us with the knowledgeable kind of stuff. Thanks admin for sharing such a great blog with us. People like to join IT field so they like to get trained through IT company. They work on live project. Thank you for sharing your info. I really appreciate your efforts and I will be waiting for your next.